ringed tail; sexes similar, minor sexual dimorphism. Social Groups: 3-27; consists of females, offspring, and males. Communication: Diverse vocal repertoire and scent-marking. Diet: In the wild, 30+ plants eaten; primarily eat fruit and leaves. Kily tree parts are a staple. In captivity, commercial biscuits, fruits, vegetables, greens, and browse are offered. Predators: Humans, birds of prey, snakes, cats, dogs, fossa. Possesses some unusual primate characteristics: well-developed sense of smell, scent-marking behavior, and numerous scent glands. Group ("troop") of up to 27 individuals. Form multi-male, multi-female groups. © 2009-2018 San Diego Zoo Global. Partial update in 2015. Population estimate updated 2018. 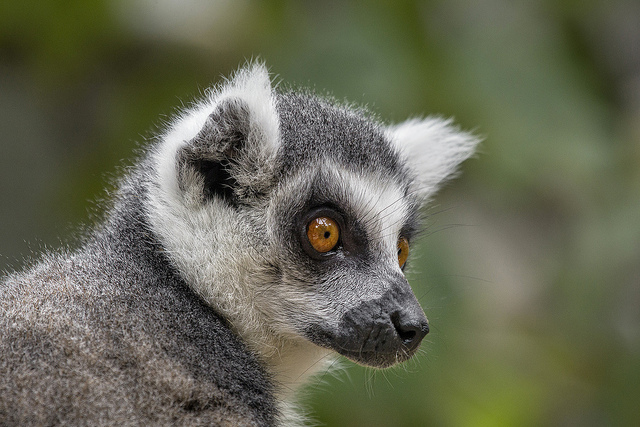 How to cite: Ring-tailed Lemur (Lemur catta) Fact Sheet. c2009-2018. San Diego (CA): San Diego Zoo Global; [accessed YYYY Mmm dd]. http://ielc.libguides.com/sdzg/factsheets/ ringtailedlemur.